US-sponsored authoritarian and death-squad regimes in Central America killed over 300,000 people during Ronald Reagan’s two terms. Lavish funding, training and equipment from Washington fueled this epic bloodshed. Victims were murdered and maimed as punishment for—and warnings against—participation in popular struggles to redistribute land and improve working and social conditions for peasants and workers in Guatemala, El Salvador and Honduras. US sanctions against Venezuela, which VP Pence announced Wednesday, target Venezuelan debt and will make borrowing more expensive, hurting the people Trump claims to help, says CEPR’s Mark Weisbrot. 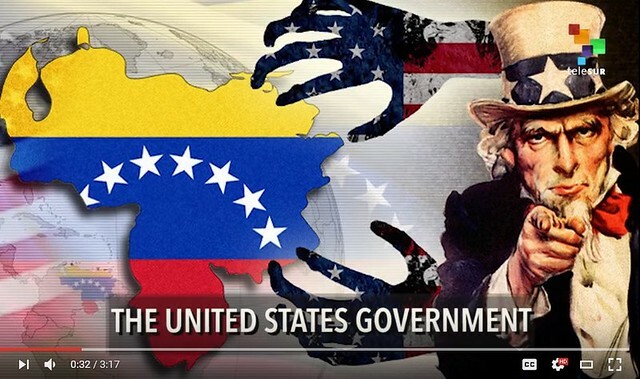 Caracas has blasted Washington’s new sanctions against Venezuela, following the latest round of restrictions that the Trump administration imposed on the oil-rich country, targeting its energy sector. This entry was posted in Cuba, Honduras, Imperialism, Oil and/or Fossil Fuels, Socialism, Venezuela and tagged Eva Golinger, Mark Weisbrot, Mike Pence, Nicolas Maduro, Paul Street, Regime Change, Rex Tillerson, Same As It Ever Was, Sanctions. Bookmark the permalink. All this talk of regime change in Venezuela seems more domestic policy than foreign policy. Just some way to look tough and possibly start a war that distracts from domestic governmental incompetence. A guy like Tillerson has to know better than I do that global oil prices are too low for there to be any profit in a Venezuela intervention. Prices are low because Saudi Arabia is in a regional Cold War with Iran. Low prices reduce the ability of Iran to influence the wars in Iraq, Syria, and Yemen. The Saudis also want to keep prices low to lessen support for Keystone XL and other North American projects. Canadian tar sands are less attractive when prices are low. Chavez wasn’t such a bad guy either. He made sure that Venezuelan tar sands oil made its way to specialized refiners in the US at a price that was profitable and fair to all parties involved back when global prices were high enough for this to work. And Chavez shared his cut to a large extent with the people. If there’s war in Venezuela, it’s not about oil. At least not in the short run.